I had several tomatoes on hand that needed to be used, some frozen corn and canned beans. 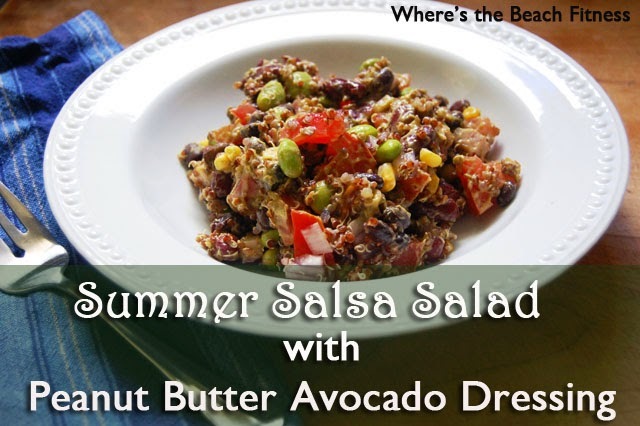 I often make a black bean and corn salsa/salad during the summer so I just ran with that general concept for flavors and textures and came up with a Summer Salsa Salad with Peanut Butter Avocado Dressing. In a blender or food processor, puree all ingredients until smooth. Re-season as needed. Combine all ingredients into a large bowl and mix in the Peanut Butter Avocado Dressing. Refrigerate for about an hour to allow the flavors to meld together and the onions to mellow. Because I had the quinoa already cooked, this came together really quickly. Even if you don't have any pre-cooked, it's still a quick and easy recipe to throw together. You can serve it as is or over a base of greens. Are you an avocado fan? What fruits/veggies do you dislike but know you should try to eat?